﻿﻿The North Crofty Signalbox controlled the junction of the North Crofty branch which left the up main line via a trailing point in the up direction. This became trailing collection in the up line when the main line was doubled in 1898. The box was small cabin with a ground frame and a single block instrument bell. In 1907 this was adapted as a block post for the up main line only. The branch was opened as part of the Hayle Railway on 23rd December 1837 and together with the other mineral branches in the area remained standard gauge throughout its life. This meant that during the broad gauge era from 6th November 1866 until the 19th may 1892 mixed gauge trains ran between Truro and Penzance to accommodate traffic from these branches. 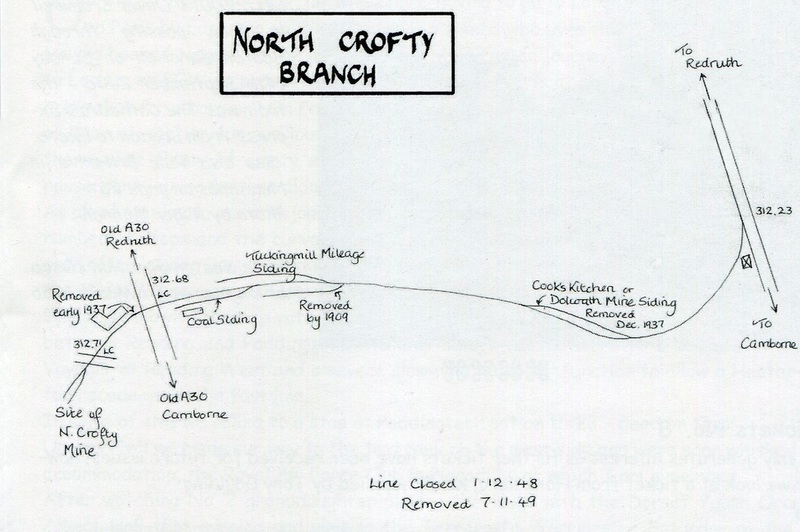 The North Crofty branch was a mere 48 chains long, 17 chains along the branch was Cooks Kitchen Siding which handled the traffic for the nearby Dolcoath mine. This closed in 1928 and was removed in 1937. At 37 chains was Tuckingmill Siding which handled coal traffic. Until 1911 (removed in 1937) the line crossed the main road (and from 1902 the track of the Camborne - Redruth Tramway) at the summit of East Hill to serve North Crofty Mine. The branch was closed on the 1st December 1948 and the track removed on the 7th November 1949. 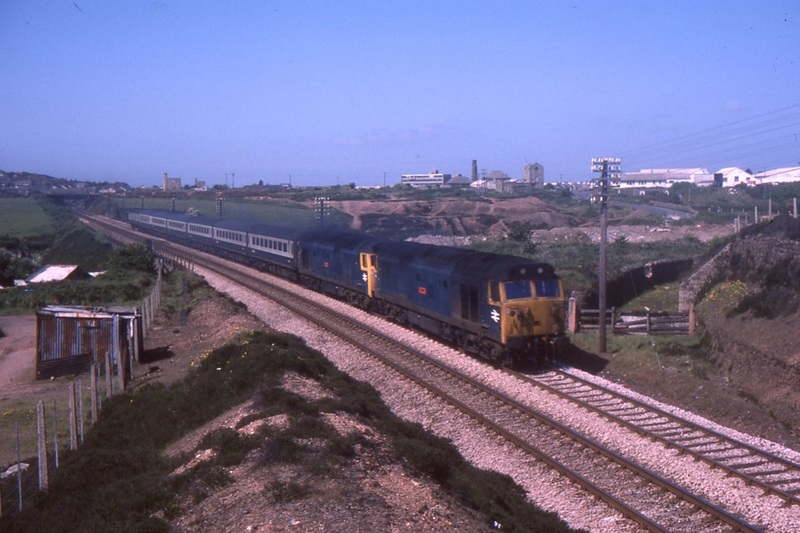 With respect to the article above it was written using a very considerable amount of information gleaned from the research of Tony Cooke who compiled the publication Track Layout Diagrams Section 10 West Cornwall. We very much acknowldge his work and also his kindness in allowing us to publish it. Further information provided by Tony Cooke. The ground frame became a block post in August 1907. From 29.10.1923 the branch was worked only on a Monday! Tuckingmill siding had a loading bank provided under an agreement dated 6.6.1913 with a John Paull. L.d. 4.2.1949 refers to Climax Rock Drill & Engineering Works Ltd. using the facility which was terminated on 25.3.1949 (after the line had closed). The Coal shed siding perhaps originally was for Messrs Bennetts Son & Co. but there was no siding agreement. Later it was Messrs Williams Williams & Co. again with no agreement. On 5.8.1908 it was reported that a Mrs. Richards complained of the use made by the GWR of her siding and it was greed to have use in common with Mrs. Richards, on the G.W.R. paying £5 p.a. and maintaining at their expense the siding off their land. This was covered by PSA 28.10.1908 with Mrs. Mary Richards. This was terminated on 10.5.1913 and the siding used solely by the G.W.R.